For SDR Console users, this video guide shows you how to access other people’s SDRs and how to add your own. Be careful when plugging multiple SDRs into a single USB2 socket to make sure there’s enough power – for multiple SDRs, you may need a powered hub ( like this: http://amzn.to/2oa84kM) [or this in North America]. Once you are up and running – please go to http://www.sdrspace.com/Version-3 and view your listing – if there is a yellow triangle, then you are not accessible outside your own firewall – attention is needed! Just because you can access it on your own LAN doesn’t mean it’s accessible via the internet!!! This is the most common area to have problems – double check your router’s port forwarding settings are correct (default port 50101 TCP). This entry was posted in News, Shortwave Radio, Software Defined Radio, Videos and tagged Jon Hudson, Remote Radio Control, Remote SDR, SDR-Console, SDRplay, Software Defined Radio on February 19, 2018 by Thomas. Lots happening with KiwiSDR – there are now over 130 live 0-30MHz fully controllable SDRs scatted around the world some in really interesting locations. Using Kiwi’s around the world is like being able to go on a exotic DXpedition any time. KiwiSDRs now include HF Fax reception natively, just select Fax in the Extension menu, select the part of the world you are interested in and the Kiwi will tune the weather fax frequency and receive the weather fax all natively (no extra software needed) – too easy! Lots more great things happening. Thank you for the update, Mark! 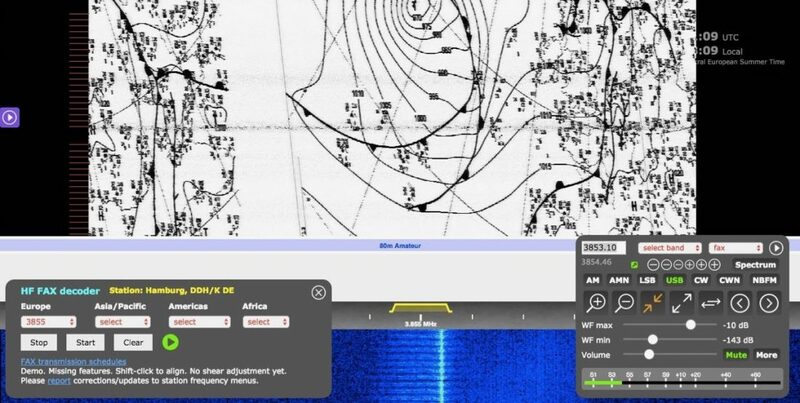 I had no idea the KiwiSDR app had an HF Fax extension. After reading your message, I loaded a KiwiSDR session in Europe and used the Fax feature. It couldn’t have been easier. The screen grab (above) came from my first attempt. The KiwiSDR network is truly amazing. I use it all the time–especially if there’s an important broadcast happening and I can’t easily receive it at home or while traveling. As an example, during the recent French elections, I listened to results roll in on France Inter mediumwave from a KiwiSDR in Italy. It felt like being there. My one feature request would be that the KiwiSDR app include some form of native broadcast recording like the WebSDR at U Twente. Many thanks for the update, Mark! Click here to read about Mark’s KiwiSDR installation. Would you like to host your own KiwiSDR? The whole system only costs $299 US. 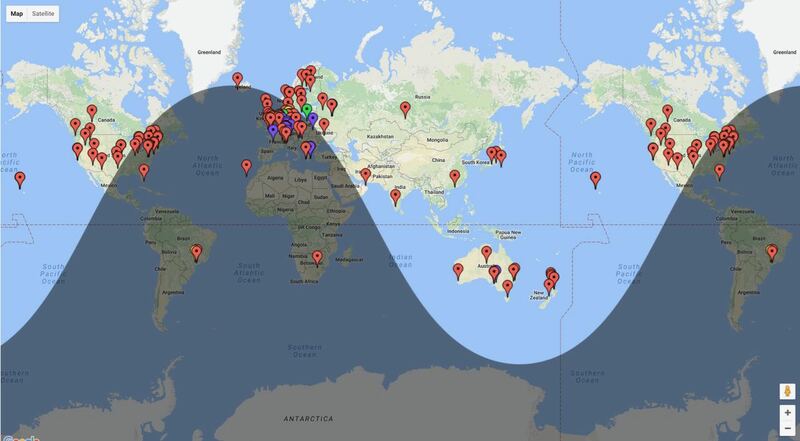 The KiwiSDR site has a list of distributors around the world. Amazon has units in stock at $299 US shipped. This entry was posted in Apps, News, Radios, Shortwave Radio, Software Defined Radio and tagged Australia, FAX, KiwiSDR, KiwiSDR for BEagleBone, Marine FAX, Mark Fahey, Remote SDR, SDR, Software Defined Radio, Weather Fax, WebSDR on June 9, 2017 by Thomas. I am Sylvain, from Cloud-SDR, a new company selling software to get remote access to your existing SDR receivers through the Internet. currently supports : SDRPlay, Perseus, BladeRF and AirSpy. LimeSDR to come when received and tested. You need a way to remotely access your existing SDR receiver? To stream your IQ samples to another remote computer over the network? Cloud-SDR is a commercial software solution to enable real time RF data sharing or processing through the cloud. Cloud-SDR can collect real-time IQ complex samples from an SDR hardware device connected on one machine, stream the samples to a second machine for demodulation or analysis, then send the resulting stream to third machine for storage. Because network bandwidth is limited compared to SDR receiving bandwidth, the core concept of Cloud-SDR is to move the processing along the cloud to where it is required or possible : the DSP chain is divided in sub-tasks that are spread between computers interconnected through Internet. I like the fact your system supports popular affordable SDRs like the SDRplay RSP & AirSpy and that you can stream your IQ samples. Click here to read more on the Cloud-SDR website. This entry was posted in Ham Radio, New Products, News, Software Defined Radio and tagged Cloud-SDR, Remote SDR, SDR, Software Defined Radio, Sylvain (F4GKR) on January 17, 2017 by Thomas. Please try out my multi-user 0-30MHz SDR[.] The test system is operating from my monitoring station at Freemans Reach in south east Australia (near Sydney). […]The test system is fully self contained and self operating. The antenna (ALA1530S+) we are using is a magnetic loop with an impedance tracking amplifier designed and manufactured by Wellbrook Communications, Llanwrth Wells in Wales. 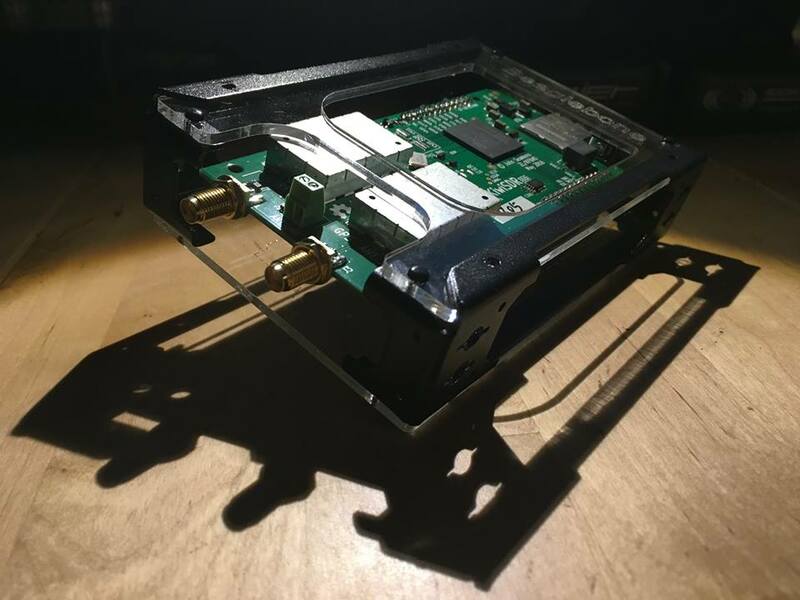 The receiver and CPU is the result of the Kickstarter funded project “KiwiSDR” which was conceived and designed by John Seamons ex Pixar and Lucas Films. Mark: you’ve done a great job making a proper listening post for your remote listeners. The KiwiSDR/Wellbrook ALA1530S+ combo is performing admirably! Click here to use Mark’s KiwiSDR. This entry was posted in Antennas, News, Radios, Shortwave Radio, Software Defined Radio and tagged Australia, KiwiSDR, KiwiSDR for BEagleBone, Mark Fahey, Remote SDR, SDR, Software Defined Radio, WebSDR on September 26, 2016 by Thomas. 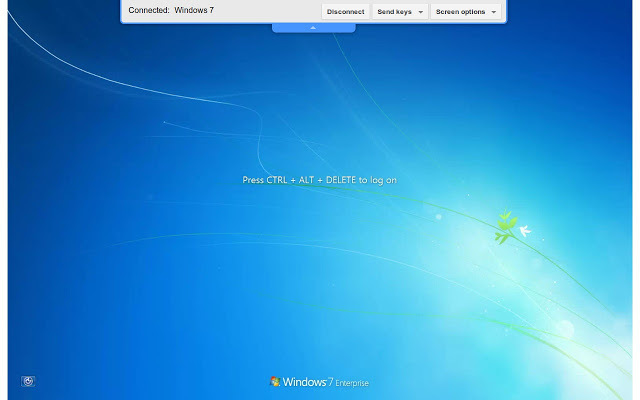 “Google Chrome Remote Desktop also works well for this. Thanks for the suggestion, Stephen! This entry was posted in News, Shortwave Radio, Software Defined Radio and tagged Chrome Remote Desktop, Remote Radio Control, Remote SDR, SDR, Software Defined Radio, TeamViewer, Travel, WinRadio Excalibur on October 3, 2014 by Thomas.